I have been writing blog articles for marketing purposes since 2010. Over the years I’ve tried out tons of different methods and hacks for generating content consistently and easily. It’s always been difficult for me to stick with my content calendar. Content Curation has emerged as a method for me to consistently creation content that my audience wants to read, and do it with minimal effort. So I’m writing this article in the hopes that what I’ve discovered can help our your content creation efforts! To “Curate” means to “select, organize and present”. So with content curation we’re simply selecting, organizing and presenting content that is of relevance to our target audience. 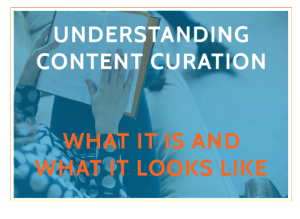 Content curation is when an individual (or team) consistently finds, organizes, annotates and shares the most relevant and highest quality digital content on a specific topic for their target audience. 1) Content curation is done by people — marketers, writers….you and I. It’s NOT performed by tools, algorithms, robots or software. When we curate content we can use these things to help us through the process of content curation, but we don’t rely on these things fully. 2) Great curated content is high quality. This should go without saying because any content that you publish on your website with the goal of driving traffic or leads, must be relevant and high quality. But content curation takes that a step further because you are not creating original content, you’re finding and presenting it. So there’s really no excuse for your curated content to be anything less than phenomenal. If you’re producing crappy content it’s simply because you’re being lazy and trying to skip steps. 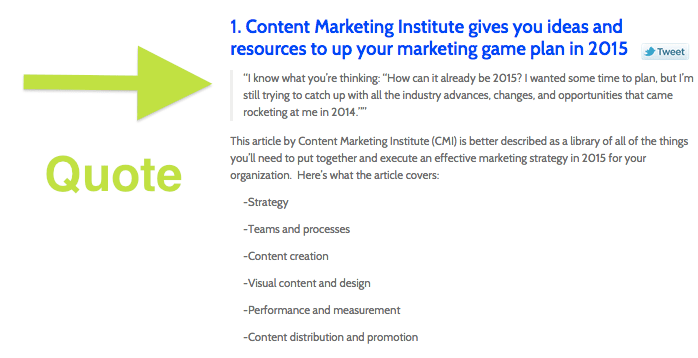 3) Your curated content must be relevant to your target audience. Again, like point #2 above, this is a given. Make sure that you have a firm grasp on your buyer personas before you set out to create a curated piece of content. Knowing your target audience inside and out is how you will know what content is interesting and relevant to them. So now we know that content curation is finding, organizing and sharing quality content that’s relevant to your target audience, and that it’s performed by people and not robots. Let look at a few examples! Hey guess what? You’ve probably already produced curated content! If you have ever shared a link to an article on Facebook, Twitter or LinkedIn…..you’re a content curator! Just think back to our definition of content curation. If you read some article that you thought was relevant and interesting to your friends/fans/audience, and you shared it with them, then that’s content curation! So my first example of content curation is pretty straightforward because there’s a great chance that you are already a pro at it. Developing curated blog posts was where I first started intentionally adding content curation into my content creation process. Blogs are a great place to start because of the freedom you have with blogging. You can pretty much write about anything (as long as it aligns with your audience and is awesome). Let’s dive into one more fully and I’ll show you how I format them and what I include. 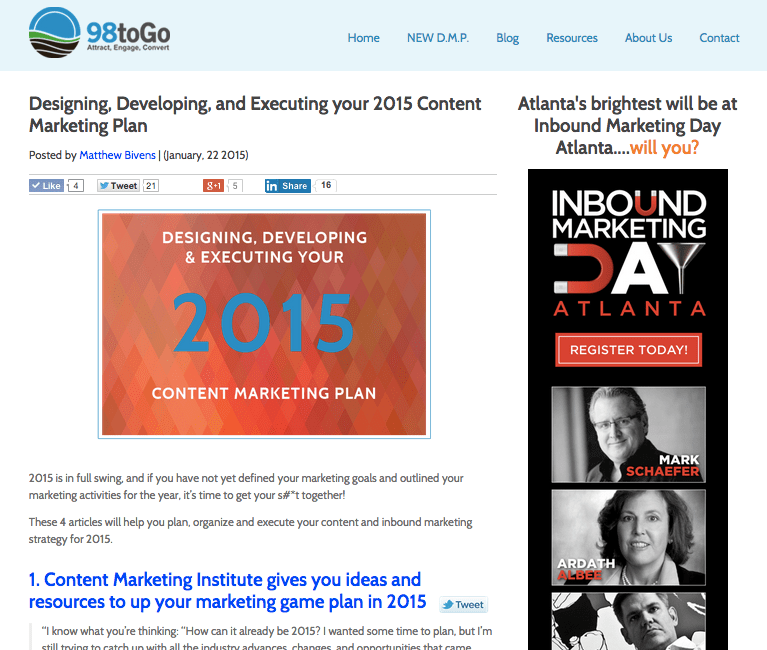 Here’s a screenshot of my post “Designing, Developing And Executing Your 2015 Content Marketing Plan”. I want to show you how I set up and format my curated posts. 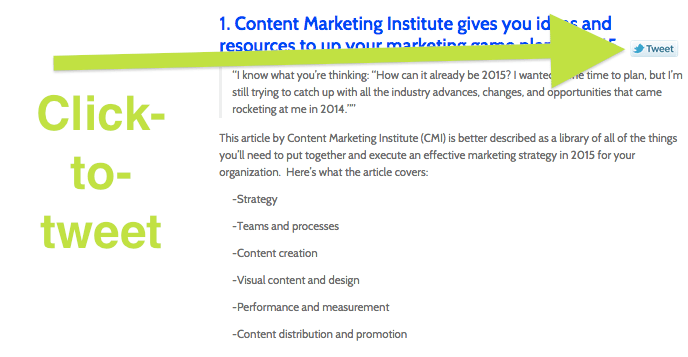 I like to include four things in each of my curated blog posts. Part of creating an ethical curated blog post is giving credit back to the original author or source. So I always include a highly visible link that will take my reader to the original author’s website. We all want our readers to engage with our content, and I’ve found that Click-to-tweet gives my readers both the ability to quickly engage with my blog article, as well as the ability to promote my blog to their audiences. I can do the latter by intentionally crafting my clickable tweet with links, Twitter handles and hashtags that support the promotion of my blog. Two birds with one stone! I always like to give my readers a bit of what I was inspired by from the original author, so in each curated post I try to include a quote from the original article. You don’t want to quote too much of the original piece, that can be considered plagiarism. So I tend to stick to a few sentences, paragraph at tops. With every curated piece of content you produce I encourage you to add a bit of your own spice to the mix. Since the essence of content curation means you’re pulling the best of others into one place, you’re own voice and opinions can sometimes be overlooked or left out completely. But it doesn’t have to be that way! You can certainly inject your opinions, criticisms, approvals or anything else, into your curated content. I personally like to give a quick summary in my blog posts, but your options here are plentiful. I recently stumbled across this tool and have started using it in my curated posts. It’s called Snip.ly. It’s hard to describe exactly what Snip.ly is, so I’ll let those guys do it themselves. But I can tell you why I like it. Snip.ly allows me to bring my readers back to my website, if they click on one of the links in my curated post. I expect that my readers are going to click away from my website to check out the articles in my curated post. Why wouldn’t they. The danger with that is your reader may not ever return to your article. There’s a good chance that they will be sucked into the content streams of the articles that you link out to. Snip.ly helps solve that problem by placing a small call-to-action on the website/article that you link out to. You can customize the message and call-to-action destination, so Snip.ly restores some of the control back in your hands. For years I have subscribed to curated newsletters. They are a great way to receive a lot of interesting information on a specific topic. The creators of those newsletters are taking advantage of the curation model, and capitalizing. The benefits of a curated newsletter are similar to those of a curated blog post. However, with a newsletter you can also directly build your list. 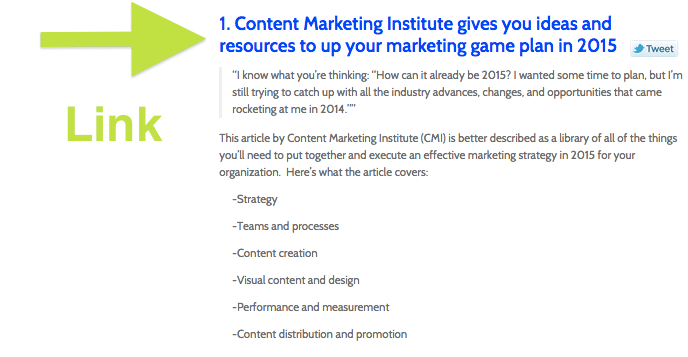 One great thing to do with a curated newsletter is to curate your own content! Yes, you can pull the best content that you’ve published over a period of time, and curate that. Content curation is not limited to other people’s content. Curating your own content can be a great way to get your material in front of your reader’s eyes, who may be opening your newsletters but not checking out your blog. 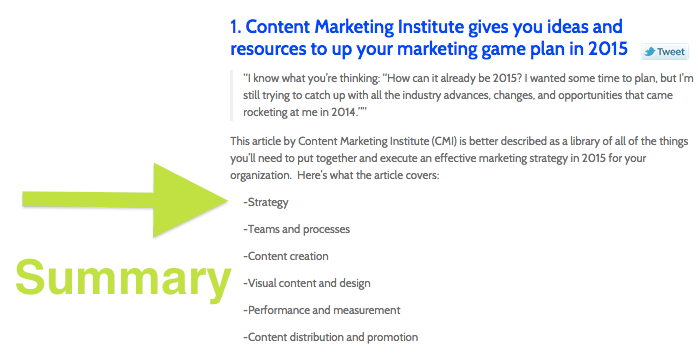 So, we’ve looked at what content curation is and what it looks like. Hopefully now you feel more acquainted with content curation and are considering adding it to your content marketing strategy. In my next article I am going to get into my 5 step process for producing a curated blog article. Stay tuned! This entry was posted in Uncategorized on May 29, 2015 by latestbiznews.